Boys ranches in Birmingham Alabama for troubled boys do not compare to Prayer Mountain Boys Ranch – Christian boarding schools and teen challenge schools. Prayer Mountain is a Boys Ranch located 50 miles southwest of Atlanta, Georgia, specializes in dealing with issues facing troubled boys ages 13-17. In the home-like environment of this ranch, boys from Birmingham, Alabama learn how to become successful, productive young men. Prayer Mountain’s beautiful 36-acre ranch campus is located in Western Georgia. In this peaceful and homelike setting, boys are able to make lasting alterations in their lives. A key component of this enduring change is relationships. We teach the boys how to form healthy relationships with themselves and their peers. This lays the foundation for them to heal other broken relationships. At Prayer Mountain, we create leaders. We are a boys ranch that not only change negative behaviors, we set up the students to be helpful role models in leadership positions. Positive behaviors are encouraged and rewarded here at Prayer Mountain. Through such positive choices, boys here advance through our three-level program. When boys arrive at the third and highest level, they will gain more responsibilities and training for leadership roles. Leadership is our ultimate goal for all the students here, and they learn that it comes with humility and responsibility. The boys that join and complete the program here at Prayer Mountain get training in leadership that they can bring with them beyond their time here. As opposed to many other boys ranches in Birmingham, Alabama, our aim is not merely changing negative behaviors but also building young men who will be positive influences on their hometown communities. Our commitment to training the future leaders of America does not stop when students complete the program here. The Emerging Leaders Program is an continued training program that shapes young leaders by granting them the tools, training, and even an on-site internship to get them ready for future opportunities. This program is an optional opportunity available to students enrolled in Prayer Mountain. In addition, there are tracks within the Emerging Leaders Program aimed at creating future staff members, educating them not just in leadership but also in the tenets and history of the Teen Challenge program. Opportunities like this are just some of what sets Prayer Mountain Boys Academy apart from other boys ranches in Birmingham, Alabama. Prayer Mountain receives a great deal of support from the community in the form of donations. As a result, we are able to offer our services to teens from Alabama at significantly lower cost than other boys ranches in Birmingham, Alabama. Due to the irrefutable success demonstrated here, our community is very thankful for the work done at Prayer Mountain. Their donations make it possible for us to offer our high quality services at prices much lower than comparable boys ranches in Birmingham, Alabama. Our goal is to uphold our high standards of care without becoming cost-prohibitive. It is clear that Prayer Mountain changes lives. As a leading low-cost boys ranch, few other programs offer the long-lasting change that is produced here. Let us help your troubled teen from Birmingham, Alabama as we’ve helped so many other families across the country. Through the environment created here at Prayer Mountain, the boys who attend this program will undergo a sincere change. In addition to becoming leaders and trusted members of their communities, they will experience a vital change in outlook. Avoiding responsibility will no longer be a part of them. Instead, they will be able to hold themselves accountable and take responsibility for their actions. They will be honest and trustworthy. Joy and peace will become a part of their lives through practice of the spiritual principles taught here. These are the hopes for boys who were once troubled and evidence that hope is very much alive here at Prayer Mountain Boys Academy. 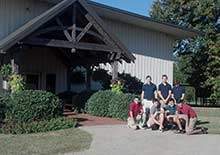 If you are looking for boys ranches in Birmingham, Alabama, we at Prayer Mountain Boys Academy can help you, even though our facility is located in Georgia. In many cases, it is best for the boys to be away from home in order to most successfully change their attitudes and behaviors. Birmingham is the largest city in Alabama. The city is the county seat of Jefferson County. According to the 2010 United States Census, Birmingham had a population of 212,237. The Birmingham-Hoover Metropolitan Area, in estimate by the U.S. Census Bureau in 2009, had a population of about 1,212,848; approximately one-quarter of Alabama’s population. Birmingham was founded in 1871, just after the American Civil War, through the merger of three pre-existing farm towns, notably, former Elyton. It grew from there, annexing many more of its smaller neighbors, into an industrial and railroad transportation center with a focus on mining, the iron and steel industry, and railroading. Birmingham was named for Birmingham, one of the major industrial cities of the United Kingdom. Most of the original settlers who founded Birmingham were of English ancestry. The city was planned as a place where cheap, non-unionized, and African-American labor from rural Alabama could be employed in the city’s steel mills and blast furnaces, giving it a competitive advantage over industrial cities in the Midwest and Northeast. From its founding through the end of the 1960s, Birmingham was a primary industrial center of the South. The pace of Birmingham’s growth during the period from 1881 through 1920 earned its nicknames The Magic City and The Pittsburgh of the South. Much like Pittsburgh, Birmingham’s major industries were iron and steel production, plus a major component of the railroading industry, where rails and railroad cars were both manufactured in Birmingham. In the field of railroading, the two primary hubs of railroading in the Deep South were nearby Atlanta and Birmingham, beginning in the 1860s and continuing through to the present day. The economy diversified during the later half of the twentieth century. Though the manufacturing industry maintains a strong presence in Birmingham, other businesses and industries such as banking, telecommunications, transportation, electrical power transmission, medical care, college education, and insurance have risen in stature. Mining in the Birmingham area is no longer a major industry with the exception of coal mining. Birmingham ranks as one of the most important business centers in the Southeastern United States and is also one of the largest banking centers in the United States. In addition, the Birmingham area serves as headquarters to one Fortune 500 company: Regions Financial. Five Fortune 1000 companies are headquartered in Birmingham. In the field of college and university education, Birmingham has been the location of the UAB School of Medicine and the University of Alabama School of Dentistry since 1947, and since that time, it has also become provided with the University of Alabama at Birmingham (founded circa 1969), one of three main campuses of the University of Alabama, and also with the private Birmingham-Southern College. Between these two universities and Samford University, the Birmingham area has major colleges of medicine, dentistry, optometry, pharmacy, law, engineering, and nursing. Birmingham is home to three of the state’s five law schools: Cumberland School of Law, Birmingham School of Law, and Miles Law School. Birmingham is also the headquarters of the Southeastern Conference, one of the major United States collegiate athletic conferences. Excerpt about boys ranches in Birmingham, Alabama, used with permission from Wikipedia. We can also help you in your search for other boarding schools, teen boarding schools, Christian boarding schools, teenage boarding schools, or rehabs for teens. This is a Teen Challenge boys ranch and boarding school program dedicated to helping troubled boys get a new start in life. Our boys ranch is a therapeutic program that offers hope and an opportunity for a new and more productive future for at-risk boys. Teen Challenge therapeutic boarding school and ranch providing behavioral therapy for troubled teenage boys.